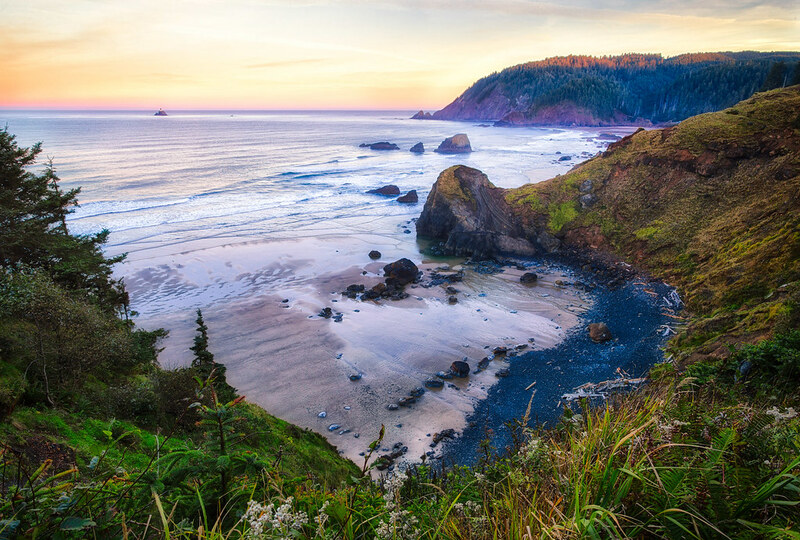 Stretching from the mouth of the Columbia River, south to Florence, Oregon’s northern coast may be the most beautiful segment of coastline in the mainland United States. The 363-mile-long coastal Highway 101 offers spectacular scenery and access to some of the finest beaches anywhere. Commanding a glorious stretch of shoreline between Seaside and Cannon Beach, Ecola State Park features a nine-mile long beach and groomed hiking trails leading to multiple elevated viewing points. Popular with beachcombers, surfers, and whale watchers, Ecola State Park includes Indian Beach, noted for its challenging surf and intriguing tide pools, and Crescent Beach, a small, secluded boulder lined cove between Chapman and Ecola Points. Both are enchanting beaches well worth exploring. Indian Beach offers a glimpse of Tillamook Rock Lighthouse located on a small island one mile off shore. From Ecola State Park the Oregon Coast Trail continues north over Tillamook Head to Seaside.